Finally, Mr. Vinny got the story of ‘The Three Little Pigs’ right. One of the most pleasant forms of entertainment for children is the puppet show, though it often takes an extraordinary amount of skill and effort to perform a great one. 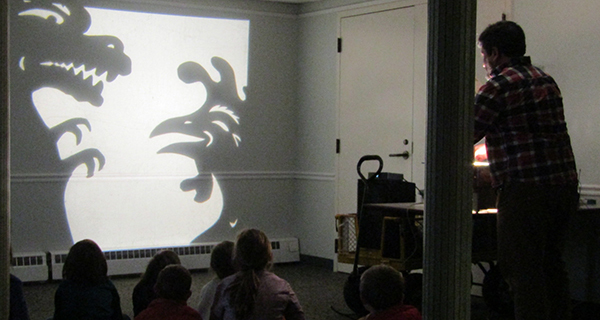 On Thursday, March 28, the Medfield Library hosted what can only described as the most lively shadow puppet show ever seen. Vinny Lovegrow is famous for his phenomenal puppet shows, and anyone who walked past the meeting room of the Medfield Library would attest to that fact. Children filled the room waiting for the puppet show to begin, which started when Mr. Vinny set up a classic overhead projector and aimed it at a wall. Then, he sprang into a storytime filled with fast-paced antics. Mr. Vinny launched into a telling of “The Three Little Pigs,” albeit with a few twists and turns. “There were 12 little pigs,” he began, before his audience erupted in disagreement. He placed a paper puppet of 12 equally-sized pigs into the projector. “No, it’s three little pigs!” they shouted in protest. Mr. Vinny agreed that 12 little pigs was not right, so he placed a new shadow puppet on the projector. This time, it was a three-headed pig. Once again, he received an eruption of disapproval for departing from the original story. Mr. Vinny settled that a three-headed pig wasn’t right and removed the paper puppet from the projector. “There was a pig and an octopus!” Mr. Vinny then announced. The room erupted into giggles and an avalanche of “No!” Finally, Mr. Vinny placed three little pig puppets on the projector. The audience breathed a sigh of relief and Mr. Vinny moved on to the next part of the story. Included in Mr. Vinny's presentation was a chicken that annoyed a fierce dinosaur. “The first pig made a house out of Cheerios?” Mr. Vinny asked. “No, it’s straw!” the kids yelled. Mr. Vinny accepted this and made sure that the little pig puppets ate the cheerios. He placed several small plastic straws on the projector. Mr. Vinny asked if the kids meant straw like hay. Soon, it was time for Mr. Vinny to introduce the villain of the story, “There was a big evil… PINEAPPLE!” The children laughed at the giant evil-looking pineapple filling the wall. When the kids made it clear that the big evil pineapple was not part of the story, Mr. Vinny quickly removed the puppet and replaced it with a tiny wolf. That wolf was far too small to be source of such destruction in the story, so Mr. Vinny replaced the puppet with a vampire puppet. Mr. Vinny eventually got his story straight and told the story of “The Three Little Pigs” correctly. The audience, which left the library with smiles and laughter, departed with a brand new way to tell some of their favorite stories. One of them could even be inspired to write the story of the evil pineapple. As Mr. Vinny proved, there is no limit to the storytelling one can do with a projector, some paper, and a darkened room.